We’ve just started Autumn here in Australia, although our days are still sunny and warm, our days now are getting shorter and cool towards the evening. 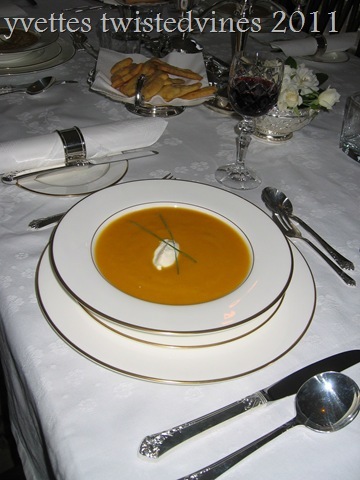 Last week we even experienced a few cloudy and rainy days, so for our dinner party we opted for a warming pumpkin and ginger soup. It’s not the first time I’ve written about pumpkin soup , however this version is made with added starchy vegetables and wholesome flavours. We garnished our pumpkin soup with a dollop of cream cheese and chives served with warm fresh bread rolls and homemade cheese crackers. 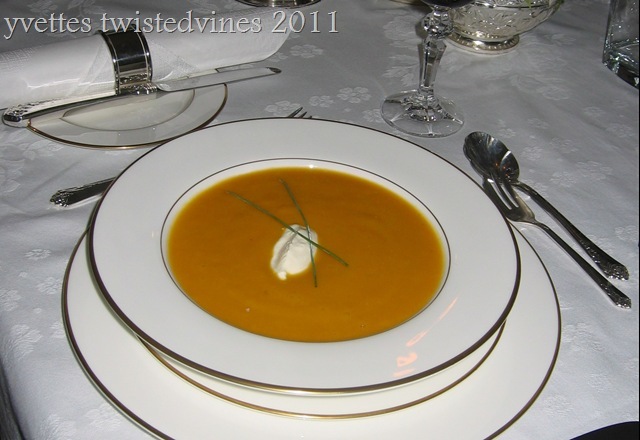 This pumpkin and ginger soup is creamy, dense and tasty. What better than to start dinner, with friends,warm conversations and a warm hearty soup. This soup can also be made the day before, giving an enriched ginger flavour. Good source of vitamin C and fibre. Source of folate and potassium. 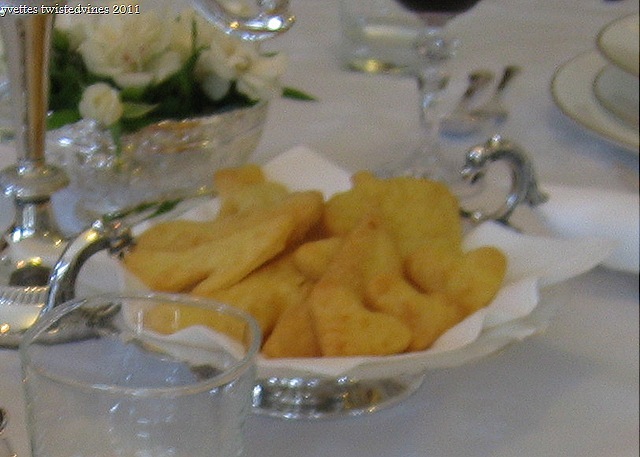 Despite their filling nature, they are low in kilojoules, with only 85kJ per 100g (2/3 cup). Americans know it as “rutabaga”. The Scottish call it “neeps” and serve it with haggis. The swede, a fairly recent root vegetable, is thought to have originated around the 17th century in Bohemia. In 1620 a Swiss botanist described the root vegetable, believed to be a hybrid of the cabbage and the turnip. By 1664 it was growing in England. Sauté the leek, onion, carrot,celery,and finely chopped garlic, then add chicken stock. Peel and chop pumpkins, large pieces are fine.Add swede,fresh ginger and nutmeg. Add water, bring to boil, then simmer for 30-40 minutes, or until vegetables are soft. Leave to cool. With hand whiz, gently blend all ingredients. To serve garnish with fresh or cream cheese and chive sprigs. A beautiful creamy, delicate and flavorsome soup. Something to warm the soul and conversation. In a large bowl, combine all of the ingredients and mix well. Refrigerate for 1 hour.Roll into a thin rectangle. At this stage you can make plain narrow strips and twist to make cheese straws, or use cookie cutters as I have.Bake in high 200°C oven for 20-25 minutes. Yvette, what an outstanding recipe for the soup – looking forward to some cool weather to give it a try and your dinner table’s decor is just perfect and I love the shapes of your cheese crackers. warm soup with warm conversations make me feel so warm and fuzzy inside. And what a beautifully set up table u have got there! 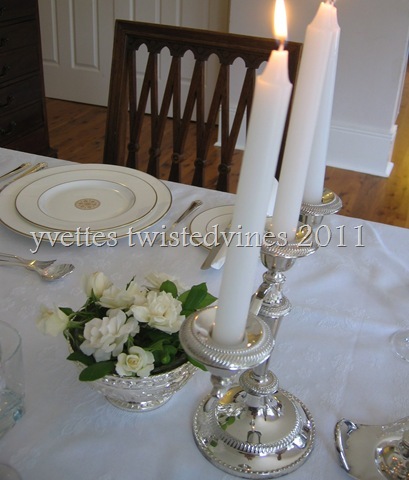 Your table setting looks amazing. 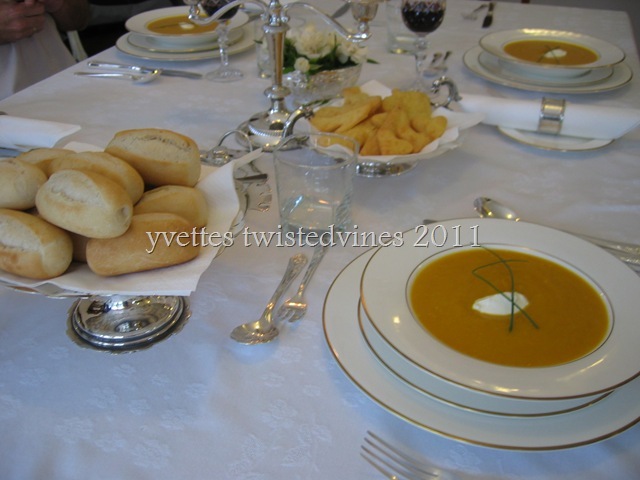 I absolutely love how you have everything set up and this pumpkin and ginger soup really looks delish! Great post. What a gorgeous, gorgeous table. You entertain like that?! Your guests are very lucky and your soup sounds scrumptious. Enjoy the beginnings of fall and thank you for stopping by my blog. That is quite an elegant table! Very inspiring. Thank you for visiting my blog and leaving me a comment. That looks amazing! I adore pumpkin, so I’ll have to try your soup recipe! Thanks for stopping by my blog, too! Thank you so much for visiting Concetta’s Cafe today and thank you – thank you for your delicious recipes!!!!! Those little cheese delights look delicious!!! I cannot wait to make this soup! Mmmmm! I have just been making winter warming soups as in Europe spring seems a long way off, and I’m suffering with a heavy cold. This looks delicious and I’ll save it for a test in ‘our’ autumn. Thanks for posting! 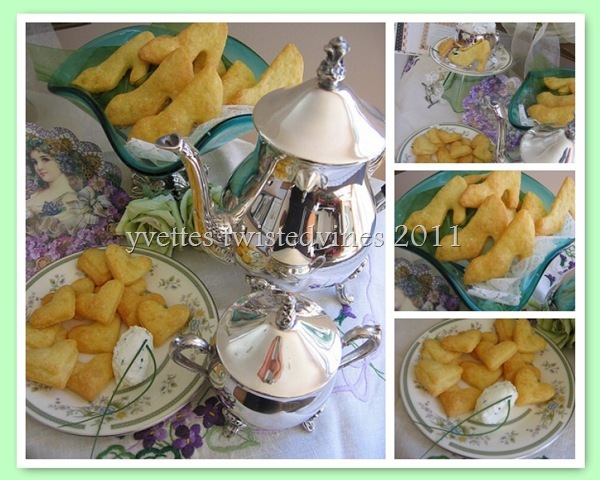 Yvette, Thank you for sharing the recipes and the beautiful photos. Your table looks exquisite and so inviting. It’s strange to think about you entering into Autumn there, and I’m entering into Spring. I will be interested in seeing you celebrate those seasons, as it will get very hot here in SE Texas USA. So I will be looking forward to some cooler thoughts. I never thought of adding leeks to pumpkin soup — how wonderful! this soup looks really amazing. And I am really eyeing those crackers!! Yum!! That sounds AMAZING…when am I invited to dinner?!? I LOVE your cheese crackers, the shapes are GREAT!!! I like this idea. That looks so good. Wow- I mean the pictures are great! So glad you found my blog so I could find yours! I wil be by often girl! Love it all! I wish I could be a eating a bowl of that soup right now. We are just heading out of winter here but it’s still cold enough at night that a warm soothing bowl of pumpkin soup would really be perfect. Wow… everything looks beautiful, so elegant! Just preparing this soup and it smells delish! Serving as a starter at a winter lunch tomorrow, can’t wait!